It’s pretty scary to know that a perfectly normal mole can look like a melanoma, and even more unnerving is that a melanoma may pass as a benign mole. 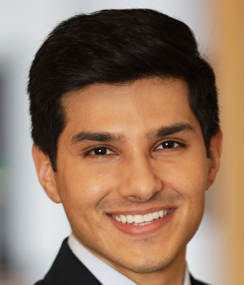 “A normal mole can look like a melanoma, and it takes a well-trained dermatologist to understand the subtle differences,” begins Zain Husain, MD, FAAD, board certified dermatologist and fellowship-trained Mohs micrographic surgeon with New Jersey Dermatology & Aesthetics Center. “When we evaluate a mole, there are numerous features we assess, including the degree of asymmetry, border irregularity, color variations, diameter of lesion and recent changes in the mole,” continues Dr. Husain. Why might a normal mole resemble a melanoma? 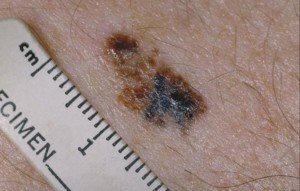 Most images of melanoma, whether online, in pamphlets or in print magazines, show lesions that appear to be well-underway in their progression, often with a charred appearance, patches of black, globules, nodules, crusting and/or blatant asymmetry. 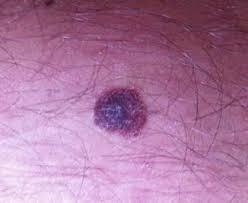 But early melanoma can look like a benign mole. Hence, a benign mole can sometimes pass as a melanoma. However, as already pointed out, sometimes a normal mole doesn’t rigidly obey the rules for what a harmless mole should look like. “We often use a tool called a dermatoscope which magnifies the lesion and allows us to better visualize pigment networks, patterns and other microscopic features to determine if the mole is suspicious for melanoma,” says Dr. Husain. This mole sure looks like a melanoma. There’s at least five colors; it’s asymmetrical; and the surface looks variegated. But it’s only an atypical mole. Dr. Husain continues, “There are moles called dysplastic nevi, or atypical moles, which contain abnormal cells but are not melanoma. “These moles are often graded as mild, moderate or severe atypia, or level of abnormality. 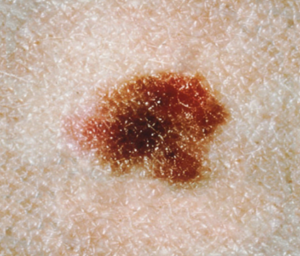 Melanoma can also arise from a previously perfectly normal or typical mole. It’s just that with an atypical or precancerous mole, a transformation to malignancy is more likely when compared to the likelihood of this happening in a normal nevus. Furthermore, many dysplastic nevi are at least the size of a pencil eraser in diameter, and this size of at least 6 mm is reason to be on high alert for malignant transformation. In fact, some dermatologists will advise that a normal looking mole of at least 6 mm be removed as a precaution. Any lesion that you ever have removed, no matter how benign it appears, and even if the removal is for only cosmetic purposes, should be biopsied! 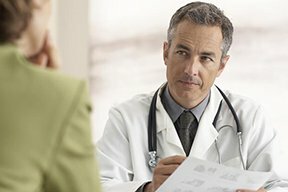 “I advise patients to get annual full body skin examinations by their board certified dermatologists to catch potential dysplastic moles and melanoma early,” says Dr. Husain. Because a normal mole CAN transform into a malignancy, you should get to know what every one of your moles is supposed to look like. Take good hard looks at them every time you do a self-skin exam. And also inspect non-nevus areas of your skin. For people with too many moles to keep a memory track of, and especially those who have a lot of dysplastic nevi, it’s highly recommended you undergo annual serial digital dermascopy.